I did it, I conquered my fear of canning and was able to preserve 9 pints of delicious cherry pie filling that I made from the wonderful fresh sour cherries from my neighbor’s tree! I actually accomplished this a week ago, but am just now getting around to posting. So this cherry pie filling recipe is pretty much everywhere on the internet. I didn’t want to get complicated, especially since I was canning this, so I stuck to the recipe that I got from the Utah State University Extension Office, however, the step by step photos are much better on the website PickYourOwn.org. However, FAIR WARNING, I discovered a few typos on the pick your own website, typos that conflicted with the recipe, so I stuck strictly with the recipe in the Utah University PDF and used Pick Your Own’s photos as a guide only. First off, if you are lucky enough to pick fresh sour cherries, always try to keep the stems intact until you are actually ready to use them. Once the stem is removed, the flesh of the cherry is exposed to the air and will begin to brown. Store your picked cherries in the refrigerator until you are ready to remove stems and pits, not more than a few days if possible. 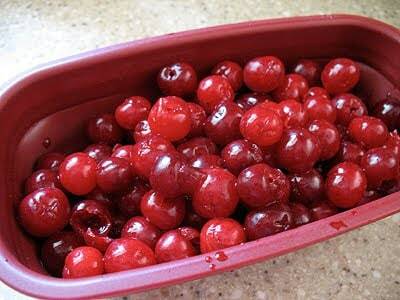 When you are ready to pit your cherries, place them in a colander and give them a quick rinse under cold water. Remove the stem and pit the cherry. 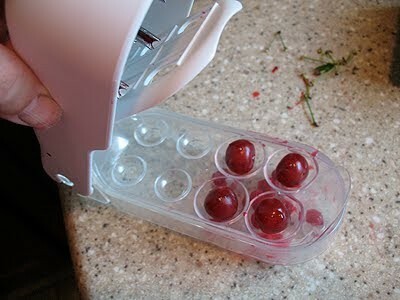 You place the 4 cherries into the little slots, then just press down on the top of the pitter and lift it back up. There’s a little collection tray underneath that catches the pits for you. It even came with a nifty little collapsable colander. After I pitted the cherries, I tossed them into the colander. When the colander was full I gave them another quick rinse then dumped them into a large glass bowl. When I was finished, it looked like a murder scene… Haha! I wasn’t quite ready to can, so I placed all of the cherries into a large plastic container with a lid and covered them with water. I cut a lemon in half and squeezed some juice into the water and let them sit until the next day. 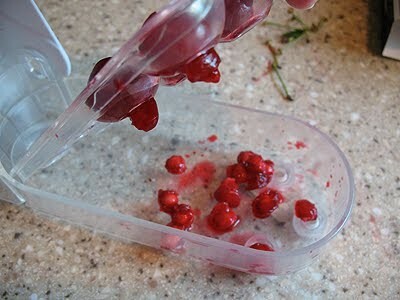 The first thing to do was to drain the cherries. 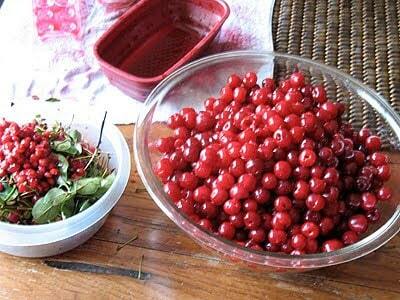 However, I did not just drain the cherries and lose all of that glorious red water they had been soaking in! I reserved the water and used that in place of the water in the pie filling recipe. 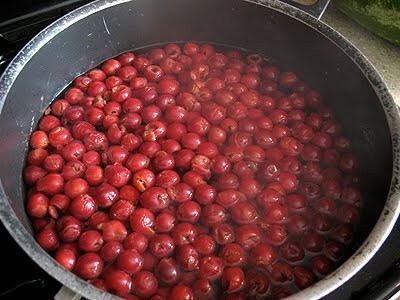 Next, I blanched them for one minute, though I definitely had to do several batches with the number of cherries that I had. After each batch, I needed to put them in a bowl or pot with a lid to keep the heat from escaping, so I just used the ceramic insert and lid from my Crockpot. 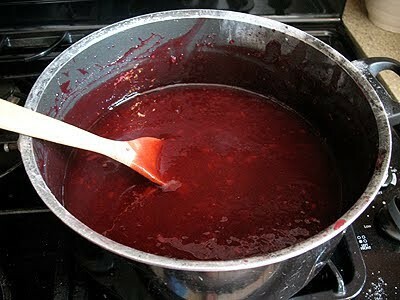 The next step is to combine the sugar and Clear Jel in a pot, then add the water. Clear Jel is a thickening agent, basically like cornstarch, but apparently it’s modified specifically for things like pie filling. You can’t find t at regular grocery stores, so I had to order mine online. So anyhoo, I combined the Clear Jel and sugar in a large pot, then I added the red water I had reserved earlier. After attempting to whisk it all together, I then added the cinnamon and almond extract. 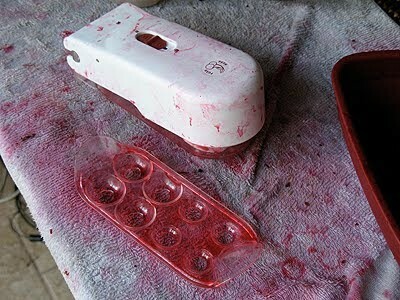 There was no need for me to add the red food coloring since I used the very red water the cherries had been soaking in. As you can see, the Clear Jel did not want to combine with the water well, and I should have known better! I know that cornstarch should be mixed with a small amount of liquid first then added as a thick liquid, but I didn’t do that. So instead, I fought with it, smashed it against the side of the pan with my wooden spoon, etc, until it was all dissolved. The warmer and thicker the mixture became, the more the Clear Jel melted in, so all was well. 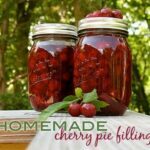 Below is the recipe for cherry pie filling, please download the PDF for processing instructions. 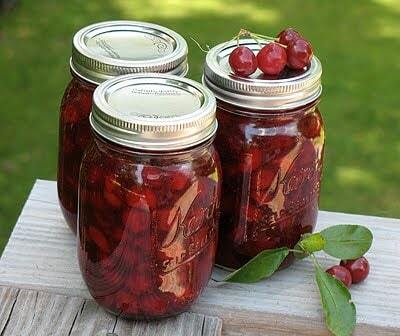 If you have a sour cherry tree, try this cherry pie filling you can keep for months to come! 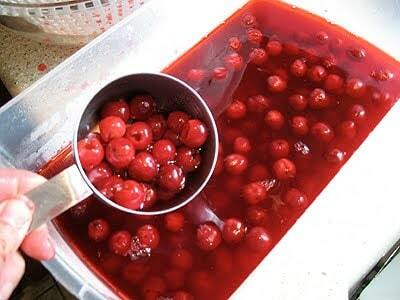 Rinse and pit fresh cherries, and hold in cold water. 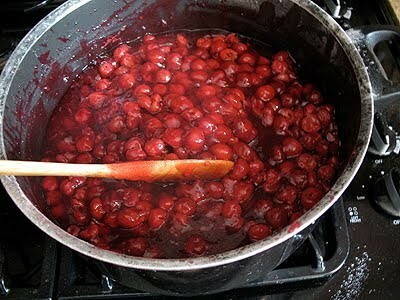 For fresh fruit, blanch up to 6 cups of cherries at a time in one gallon of boiling water. After water returns to a boil, boil for one minute. 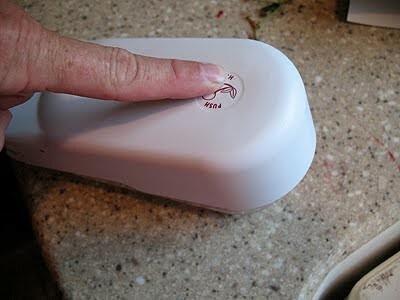 Drain, but keep heated in a covered bowl or pot. 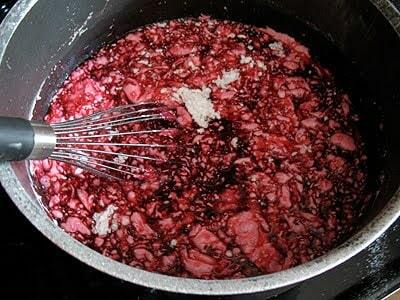 Combine Clear Jel and sugar in a large pot and add water. Add cinnamon, almond extract and food coloring. Stir mixture and cook over medium high heat until mixture thickens and bubbles. Add lemon juice and boil one minute, stirring constantly. 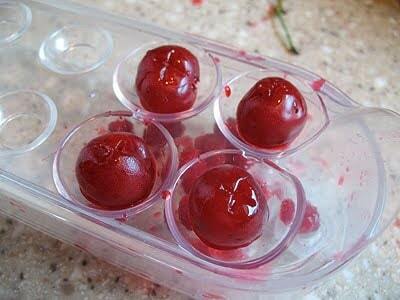 Fold in drained cherries immediately. Fill your jars with mixture without delay, leaving one inch headspace. Adjust lids and process immediately. 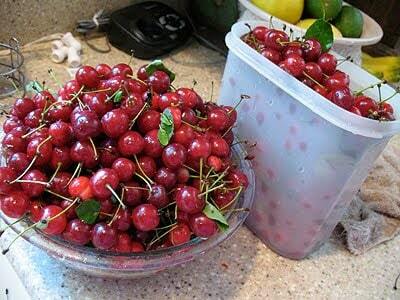 Instructions for 1 quart, adjust quantities based on the measurement of cherries you have. 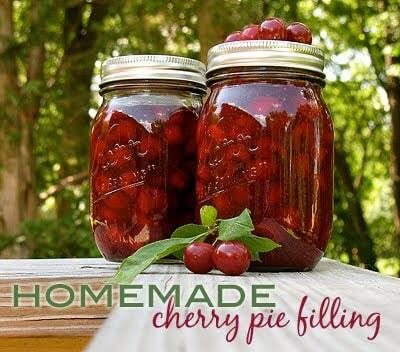 If you are not canning, you can make this filling and keep it in the fridge for up to 3 days. I will be sharing with you my cherry version of the blackberry pie squares that were such a big hit around here. Did you use the cook type of clear jel or the instant? Thanks! 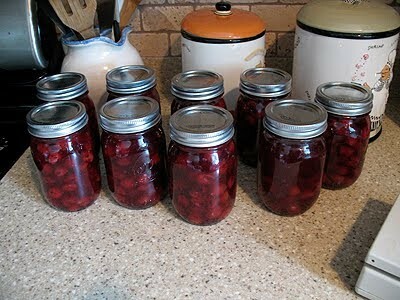 For canning, you want to stick with regular Clear Jel – Not instant. It sounds like you may not have left enough head space in the jar, or you didn’t get a good seal on the lid. Made this recipe, was very tasty. I left out cinnamon, almond extract and red food coloring and I added 1/2 teaspoon Mexican pure vanilla. I also mixed the clear jel and sugar together before adding. Worked great, mixed right in no problems. 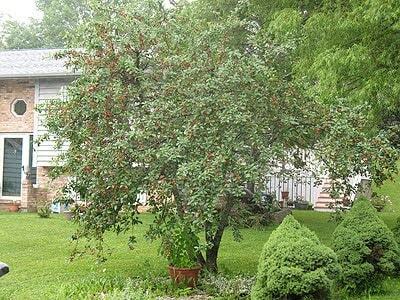 I have 2- 15 year old Montmorency cherry trees. I live in central Wisconsin. This year I got over a 100 pounds of cherries. I have to net my trees to keep birds off. Best year ever. Was looking for something other than jam, you can only use so much of jam. I even had enough to share with friends. All said they were amazing.